At the mention of Sicily, hopefully some of the first things to pop into your mind are sunny beaches, Mediterranean air, fresh seafood, and possibly even delicious wine. Two of the coolest things about Sicilian wines are that they are approachable both in style and price. They offer some of the best—and diverse—options for introducing yourself to Old World wines. But unless you actually go there, it can be hard to realize how large, and unlike an island, this island really is. Its surface area is actually three times the size of New Zealand! They produce between 100 and 130 million gallons of wine per year. That is equivalent to about 2 million oak barrels! The region is also number one in Italy for organic wines, boasting 38% of Italy’s total organic wine production. The first record of wine on the island dates back roughly to 700 BC when the Greeks occupied the island. Wine appears again in Sicily in the volume “Natural History,” when Pliny the Elder mentions the Mamertino wines produced around Messina. From about 831 to 1072 AD vines risked extinction altogether when the Arabs dominated the island. The reign of Frederick III of Aragon in the early 1300’s finally unchained the wine trade in Sicily, but their industry didn’t start to pick up until the 1500’s. Nearly four hundred years later, in the early 1990s, Sicilian wines started to make a mark on the international market. This was a thanks in part to the blending of international varieties (Cabernet Sauvignon, Merlot, Syrah, Pinot noir Chardonnay, Sauvignon blanc, and some might say Riesling) with indigenous grape varieties. The result was a group of wines that were more understandable to consumers in the global market. Currently about a third of the wine production in Sicily comes from international varieties and two thirds from indigenous grape varieties. With so many types of Sicilian wine out there, experimenting on your own and finding new wines to like is easy, especially with some fun food pairings. If you like light and crisp wines like Sauvignon blanc, a good Sicilian wine to try is the Planeta Eurazione, which is made of 90% Carricante, an indigenous grape to Sicily, and 10% Riesling. It has aromas of apple, mango, and white flowers. It is light and crisp on the palate and offers a bright finish with flavors of lemon curd. Pairing it with a dish like grilled prawns tossed in lemon juice and garlic works splendidly. Or if you can make it or find it, the Sicilians also like to have this wine with octopus salad. Any seafood salad will work! Another fun white is the Insolia by Cusumano. This indigenous grape makes a full bodied and aromatic wine. It offers aromas and flavors of lemon and herbs, is smooth and rich on the palate and finishes with a hint of toasted almond. It is delicious with any pesto dish. The Donnafugata Sedara, which is predominantly Nero d’Avola, one of the most important red grapes of Sicily, is the perfect everyday red wine. Full of wild blackberry and raspberry fruit, it is juicy and quaffable and excellent with pizza or a quick tomato-based pasta dish. If you want to get a little more serious, another delicious Nero d’Avola is the Feudi del Pisciotto Versace Nero d’Avola. It has a deep bouquet of rose and ripe red cherry, is full on the palate and has a long, complex, and spicy finish. It is works beautifully alongside roasts or game. Plus, a serious meal will need a conversation piece and the label on this bottle is a good one. In the vain of creating wines that truly express the “Made in Italy” theme, the head of Feudi del Pisciotto decided to call on famous Italian artists and designers to create the labels for his wines. And what’s even better, a small portion of the winery’s revenue goes to reconstructing ancient works of art in Sicily. Donatella Versace, a lover of Nero d’Avola, chose the original Medusa head Versace logo for this wine, which for the Versace family symbolizes their desire to catch the eyes of audiences with astonishing and stylish designs. 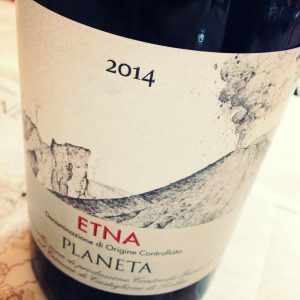 The Planeta Etna Rosso, made from the grape indigenous to Mount Etna called Nerello Mascalese, is an engaging wine with complex aromas of rose buds and stems, forest floor, sour cherry, strawberry, and rhubarb. On the palate it is full and smooth with a long spicy finish and suede-like tannins. This is a fun red too because it even works with fish! Try it with some pepper and herb encrusted grilled cod or seabass with a side of Caponata. 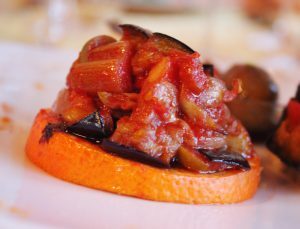 If you aren’t familiar with it, Caponata could be described as a Sicilian interpretation of Ratatouille. 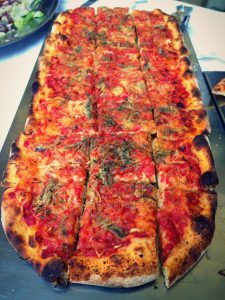 It also works well as a bruschetta topping, or be super authentic and serve it atop an orange slice, like the Sicilians do. If you have a little spare time, it isn’t difficult to make on your own. It’s totally worth it! Saute celery briefly so it is still crisp. Set aside. In a wide saute pan over medium-high heat, warm 1 c of olive oil. Saute the eggplant, making sure to cook thoroughly. Transfer to a plate with paper towels to drain. In the same pan, warm the remaining 1/2 c of oilive oil, then add the onions and saute until translucent, about 8-10 minutes. Add the reserved celery and tomoato puree and simmer, stirring occassionally for 10 minutes. Add cooked eggplant, capers, olives, nuts, vinegar, sugar, and herbs. Stir well and simmer, uncovered over low heat for 20 minutes. Season to taste with salt and pepper. It is best to reserve for the next day so flavors can meld but it is also possible to serve immediately.